Today the squirrel put on his Trump- “Make America Great Again” Cap and went out from his squirrel den onto the tree branch. He stretched out his arms and yawned as he looked around. “What a great day!” he shouted as he adjusted his oversized cap. 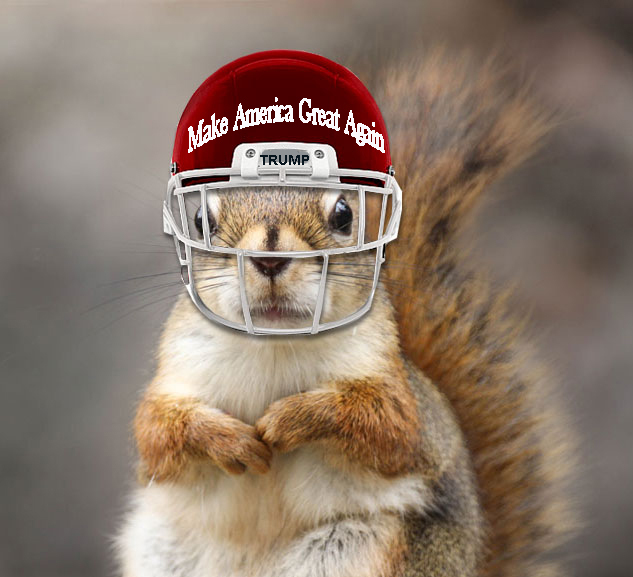 “I am ready to help make America Great Again.” With that announcement he quickly squirreled down the tree. When he reached the bottom, he stopped. He stood erect and looked around. He sniffed the air, then instantly shot forward toward the bushes. Once inside the thickest part of the foliage, the Trump Squirrel started scratching at the ground feverishly. Another squirrel entered the bushes and hurriedly ran past. Then stopped abruptly and looked back at the Trump Squirrel. He had a curious look on his face. He slowly approached the Trump squirrel who was still furiously digging. The squirrel laughed. He rolled back in the foliage and laughed and laughed. Meanwhile, the Trump squirrel kept on digging. He began to dig faster and deeper and with more vigor than he had before. The other squirrel stopped laughing and began to notice the great intention the Trump Squirrel was showing as he dug feverously. The hole became deeper and deeper as he watched. Have you ever considered creating an e-book or gust writing on other blogs? I have a blog based upon on the same topics you discuss and would love to have you share some stories/information. I know my viewers would appreciate your work. If you’re even remotely interested, feel free to send me an email.